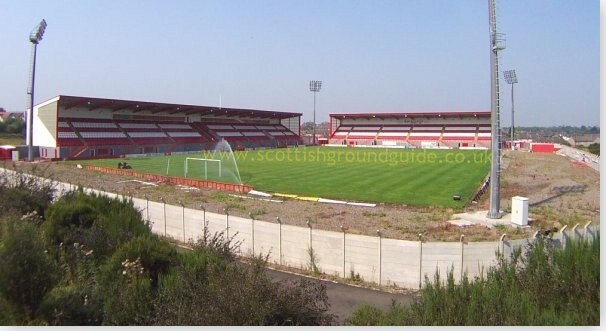 The stadium was opened at the start of 2001/02 season and is not far from the site of their former Douglas Park ground from which they left in 1994 (the club ground shared in the intervening years). Alas nothing remains of the old ground to be seen, in fact the site is now occupied by a Sainsburys supermarket. The ground is largely comprised of two fair sized stands at one side and at one end of the ground. Both are covered and all seated. They are unusual, in terms of modern stands, in that they are both raised above pitch level, which means that spectators have to climb a set of stairs, to reach the seated area. These have been supplemented by a small covered temporary stand on the East side of the ground. This area has a capacity of 700 seats. There are also four striking floodlight pylons in each corner of the ground. One point of interest was that last season the club had an artificial surface. On promotion to the SPL this has been replaced by a traditional grass pitch. Since this photo was taken a small temporary stand has been erected on the right hand side. If anyone can provide me with more up to date photos, then please e-mail me. Away fans are normally housed in the North (Spice Of Life) Stand where the view of the action is good. For those clubs with a smaller following then a section of the West (Main) Stand will be allocated instead. Alan Redman a visiting Morton supporter adds; 'there is plenty of legroom in the North Stand, but wrap up well in winter as being as the ground is largely open, the wind blows right through it'. Ross Clark, a Hamilton fan informs me; 'Despite having only the two stands at the moment, it's possible to make quite a lot of noise from either stand. You kind of forget that there's nothing on the other side of the pitch until the ball goes out and it takes the ball boys far too long to retrieve the ball from the far wall. (a few impatient staff have taken to just punting a new one on almost as soon as it happens). The evening matches in the dark have been better for atmosphere'. Craig Irvine recommends; 'The Clansman Bar in nearby Burnbank, which is a decent pub. There are two other local bars at Peacock Cross; the Silver Tassie and Harvies. The Chambers at the court is also not bad.' Jim Galloway adds; 'The Railway Club in Clydesdale Street is a good place to go for a drink before the game and non members are welcome on matchdays'. Leave the M74 at Junction 5, and follow the signs for Hamilton. You will pass the racecourse on your left and a large fire station on your right. At the first set of traffic lights, turn right into Caird Street. On your left will appear a fair sized car park, which you can park in (I believe it is free on matchdays) and embark on the five minute walk to the ground. The ground is down New Park Street, which runs beside the bingo hall. Or if you continue along Caird Street, you turn right, just before the traffic lights (and bingo hall) into New Park Street. You will come to the ground entrance on your left. There is no parking available for supporters at the ground itself, unless you are a club official, or have a valid disabled permit. However, due to limited space even these should be pre-booked with the Club. The ground is only a few minutes walk from Hamilton West station, which is served by trains from Glasgow Central. Please note that Hamilton Central station is quite far away from the ground. Concessions apply to Over 65's, Under 16's and full time students who have a current matriculation card. For the Hamilton fixture list click here (to take you to the BBC Sports Website). If you require hotel accommodation in the area then first try a hotel booking service provided by Football Hotels who are powered by Activehotels, who specialise in locating accommodation near or within a short travelling distance of the football ground. They also have the added advantage over some other hotel booking services that you pay on departure. Yes this site will earn a small commission if you book through them, but it will go to help with the running costs of keeping the Guide going. To access their Hamilton page click here.